The Day after Christmas...a time to reflect and remember when Christmas was more than playing electronic games. 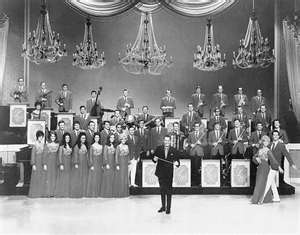 It was a holiday when people sat around a black and white television and watched Christmas shows from entertainers like Lawrence Welk and Andy Williams. 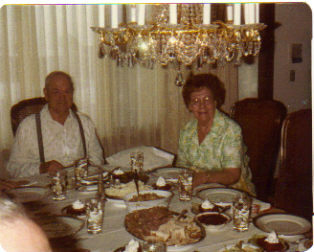 (My grandparents and parents eras) You watched Macy's Thanksgiving Day Parade and knew that the Christmas holiday season had officially begun because Santa arrived at the end of the Parade. Ahhh...Christmas to me is reading Christmas stories and singing group Christmas carols to our neighbors, having a turkey cooking in the oven, egg nog on the table, cookies on a tray, a poinsettia in the window, a fire in the fireplace, and finishing off the decorations of the Christmas Tree on Christmas Eve. Do we still have some of these traditions? And if not, have we created new ones for our children and future generations? I'm sure that most of us have different ways to celebrate the holiday season in December. For me, Christmas Day has come and gone and I look back at what the last two days brought. The laughter and sounds of wrapping paper being ripped apart is now the silence of a large trash can outside filled to the brim of all the trimmings... The yahtzee dice and the Uno cards are now put away on the shelf of the hall closet. The day after...A time to collect my thoughts on all the preparation of the holidays and hoping that they were enjoyed by everyone that came by. And to wonder why Mr. Damsel would give me a box of Dunkaroos for Christmas...??? (Ok...to be fair, I did order my Eagle Claw 6'6 fiberglass rod which arrived a little before the holiday) Thanks, hun. The last 15 years or so, I have felt something missing at Christmas. I know what it is. And by writing it into this blog, I will hopefully start a new tradition next year. You see, when my Grandmother passed away, so did a family tradition at Christmas. She was a workaholic who day after day, planned Christmas all year long. She would shop for Christmas gifts probably in January and hit all the sales that she could find. Putting away her great finds of combs, brushes, colognes, shampoos...just a lot of one dollar items that you could find at the drugstore back in the day. These were to be part of her Christmas Eve "game prizes" after our family dinner. The rest of the prizes would be those of a homemade nature. She would crochet clothes hangers (which all of us treasure to this day), sew up kitchen aprons, hot pads and dish towels. Ties and socks for the guys... 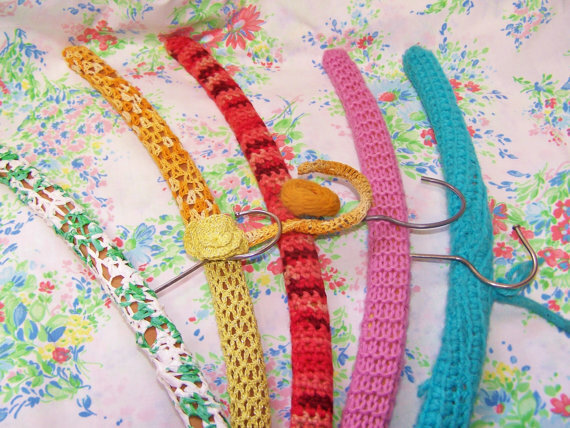 There were also the lap quilts, that I still cherish in my cedar chest! And then there was the fudge and divinity that she would make the whole month of December and put away for the big party. (My little fingers seemed to find the candy's secret hiding place!) My grandmother was a talented woman with as much love for her kids and grandkids as anyone could have. Such an example of love and true charity to her friends and family. She had the true Christmas spirit all year long and would always enjoy giving away rather than receiving. Traditions come in so many different forms...food or activities. On David's side of the family...we have oyster stew, chili, and tapioca pudding on Christmas Eve. On my side, we have prime rib of roast, cheesy potatoes, and ice cream cake. Christmas songs are played on the piano by my mom and we have a good ol' sing a long. This year, my dad broke his hip and is still in the rehab center, so we missed our lead singer and chorister on Christmas Eve. Then, there is Christmas Day where we have a special brunch which my kids have always enjoyed. 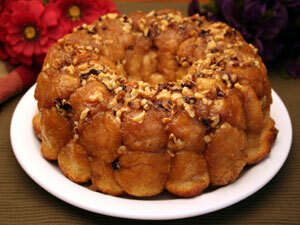 A breakfast casserole is served, along with the RD's famous "Monkey Bread". But, The "Merry Christmas" game that my grandmother started, still needs to be re-lived. My mother didn't carry on the tradition. But, it is something that is forever etched into my memory as being the best time of the year. Because of the togetherness of family and the smiles on everyone's faces. It took a little work...ok, it took a lot of work. All of the prizes were wrapped and put into each "head of the family" box. So, my mom and her two brothers and sister each had a box of prizes for their families. There were about eight card tables set up in the living room and dining room. If one of the neighbors had peeked through the front window, they would have thought it was the craziest bingo game that they had ever witnessed! Grandma would call out a number. We would shake all of our dice and hopefully get that number. If not, the dice were passed on to the next person at the table. Kind of like the game of Bunco. (Hey, Grandma had the right idea!) There was a scorekeeper who would make chicken scratches and as soon someone could spell out "Merry Christmas" with their rolls, they screamed out those prolific words and were declared the winner. Ahhh...memories of great traditions. Cherished from the past and hopefully to be re-lived again in the future. Welcome back buddy. Are those sticky buns I see? Wonderful holiday traditions...ah for the good old days. Ah...don't want to seem rude, but the place could use a little dusting. Thanks. We knew you wouldn't be gone long. Hi Mark! ~ No, just a few weeks of R&R...should have some kind of fishing report by the end of the day! <"((((><< Happy Holidays to you! Sanders ~ Thanks and sure did enjoy your latest guest post over at backcountryjournal! The journey .. must live. On! Some wonderful traditions, especially your Grandmother's. 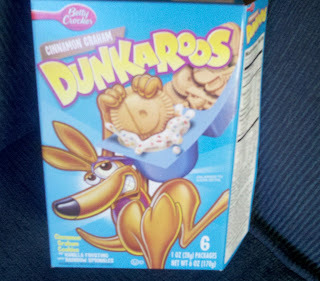 And if you don't want your Dunkaroos, I'll take em. Mike - I'm afraid that when I poked fun at them, a teenage boy of 16, grabbed on to them...And I don't think you want to wrestle a 6'6 250 lb lineman for silly grahms and frosting! Ha! I wish we all could get back to those Christmas of yesteryears like you have described in your post. It seems now days everybody is in such a hurry and really don't take the time to stop and really get the meaning of Christmas anymore. Thanks for sharing this post with everyone, because it brought back some fund memories.